A recent, cold, February morning I woke up with sunshine pouring through my window. 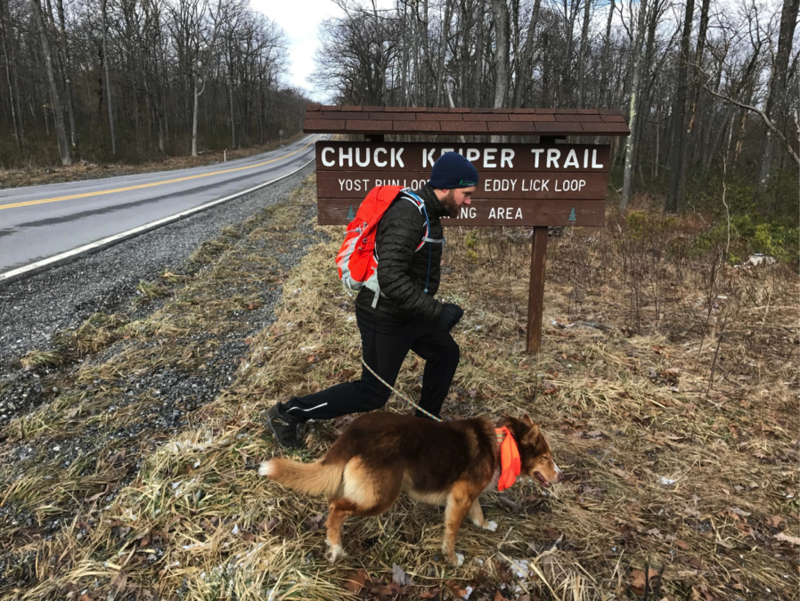 Eager to hit the trail and complete additional milage on the Chuck Keiper Trail, I called up the author of the Chuck Keiper Trail guidebook: Dave Gantz. While hiking in the winter months, I have two important rules when deciding where and when I want to hike: accessible trailhead, but remote wilderness. Conveniently, Sproul State Forest meets both of these criteria. The Chuck Keiper Trail parking area sits right along Route 144. Although this area is remote, I have no concerns about accessing it, as it is a well maintained road. Once on trail, though, you quickly lose sight and sound of the road and feel as though you are on trails untouched for years. While out on the Eddy Lick trail in late February, we did not see a single person. Once you are parked in the CKT parking area, you cross the road to see a nice wooden sign and enter a wooded area. Alas—Gantz, Emily and Rogue the adventure pup were off on our journey to complete the Eddy Lick Loop. 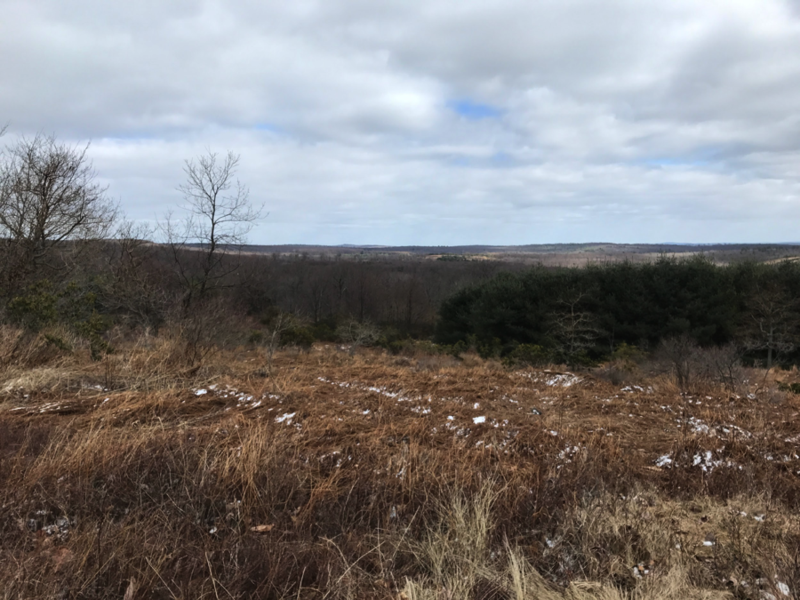 Most hikers follow this loop counter-clockwise: After beginning at route 144, approximately 0.2 miles ahead, you turn left on a dirt road for a steep decent on a road before meeting up with an old, unwelcoming hunting camp with bars across the window. Turn right and then, just after this camp, you’ll take a left. Watch your step! This area is wet, and during the winter, you can easy mistake a large puddle for some easy snow covered ground. Just before crossing Eddy Lick Run, turn right again, and follow the orange blazes to a cool camping area on the opposite side of the stream at mile 1.3. This was a perfect chance for Gantz, Rogue and I to make a quick stop, check out the map and munch on some trail mix. The stream was flowing fast that day, which made for some beautiful sights and sounds. After our quick stop, we continued on a trail that led us uphill towards large trees and ferns and back downhill to the water. This area was specifically my favorite. 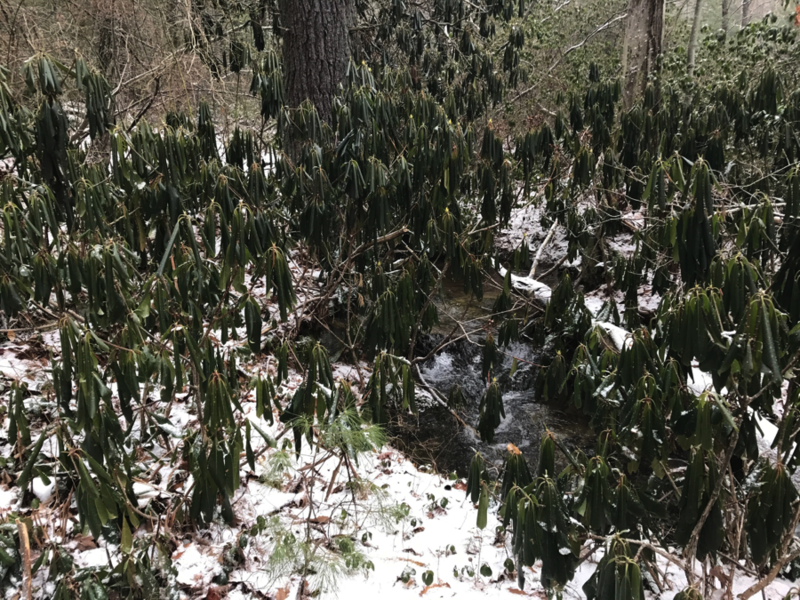 Several times I stopped as we climbed up to overlook the forest floor—snow covered rhododendron and icy streams. Eventually the trail leads you to an old railway bed. This is very noticeable, as the grade is no more than 3% at any given point and there are subtle bumps from the old rail ties. 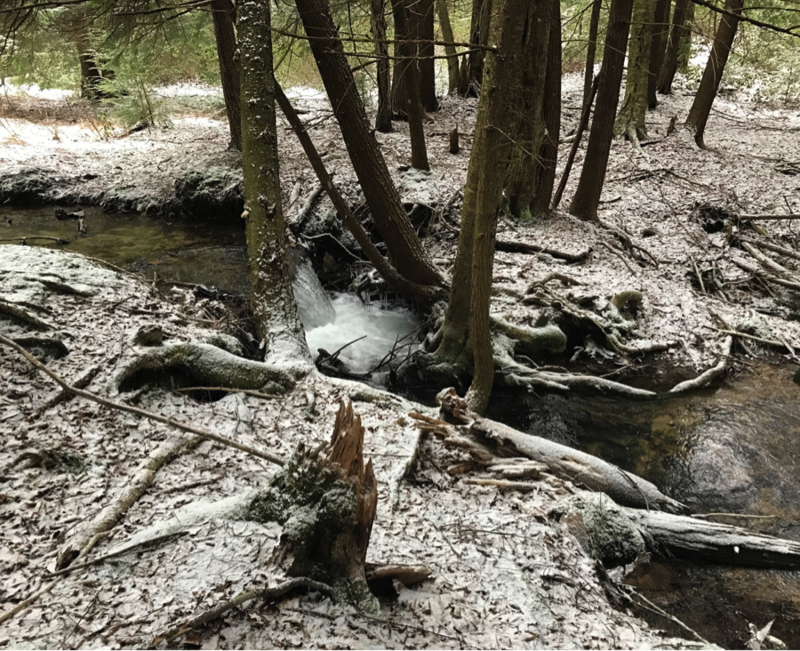 At mile 3.0, you cross a narrow side stream on logs and will notice an old splash dam that was built over 100 years ago as means to move timber from these mountains to the sawmills. From the splash dam, you will cross a wooden footbridge, a small seasonal stream and immediately start climbing away from Eddy Lick Run. Later, the trail will meet with a dirt woods road. Follow the trail across the road and reenter the woods and you will start following a railroad bed again. After some time, you will reach a trail register. Don’t forget to sign in and thank the volunteers who keep the trail maintained! Try to find Gantz, Rogue & my signature from 2.26.17 (and let us know when you hiked it so we can find yours!). 0.1 miles after the trail register you will take a right onto an old woods road. 0.1 after that, you will reach a gravel road named De Haas Road. Cross De Haas Road and follow the yellow blazed trail (which also follows a snowmobile trail with orange placards) as it leads towards route 144. 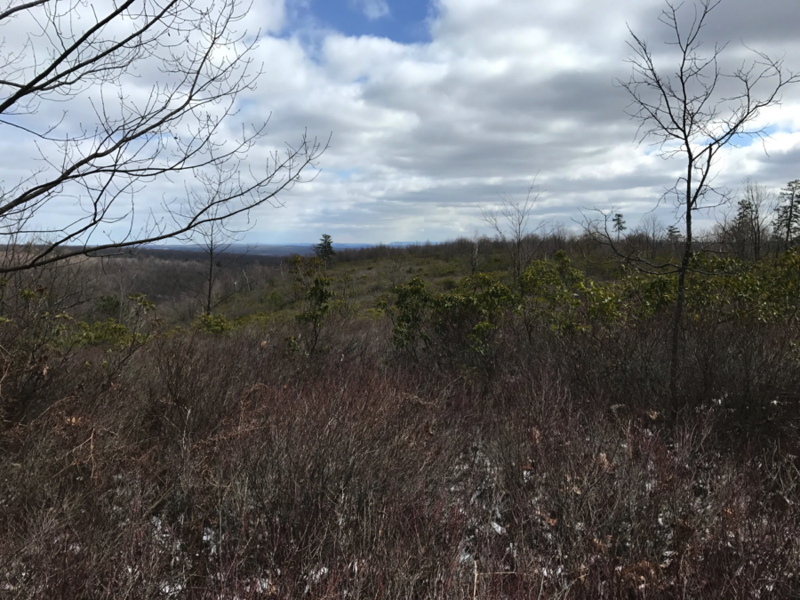 This section has some nice views during the winter, but would provide some amazing blueberry picking during the summer. Gantz, Rogue and I followed some old, local trails that would be a pristine berry picking place. I can’t tell you at what milage though—Gantz and I promised to keep that a secret. After following snowmobile trails for roughly 2 miles, you will approach route 144 and Two Rock Run Vista Parking Area. Just before the parking area, you will take a left onto the grass double track road and follow this until you descend. At this point, you will meet up with the old, janky cabin from the beginning. Climb straight up that hill that you climbed down in the beginning, turn right onto the Chuck Keiper Trail, cross Route 144 and wa-laa—back to the parking area. Hopefully your car is there when you return! After almost 11 miles, the hike is finished, but I would suggest taking your hiking buddy to get a beer and burger. No hike on the CKT is complete without such!